Set on the North Coast of North Wales, Llandudno is often described as the Queen of Holiday resorts. It is dominated by the massive limestone bulk of the Great Orme and still retains much of its Victorian grandeur. It was beginning to feel run down and neglected twenty years ago, but now the buildings are all freshly painted and the town is thriving. There is something for all ages from the traditional Punch and Judy shows on the North Bay to a vintage bus ride along Marine Drive. Although the town only dates from the mid C19th, the Great Orme has been inhabited since prehistoric times and copper was mined there in the Bronze Age. Much of the surrounding area was low lying and marshy, and ignored by settlers. 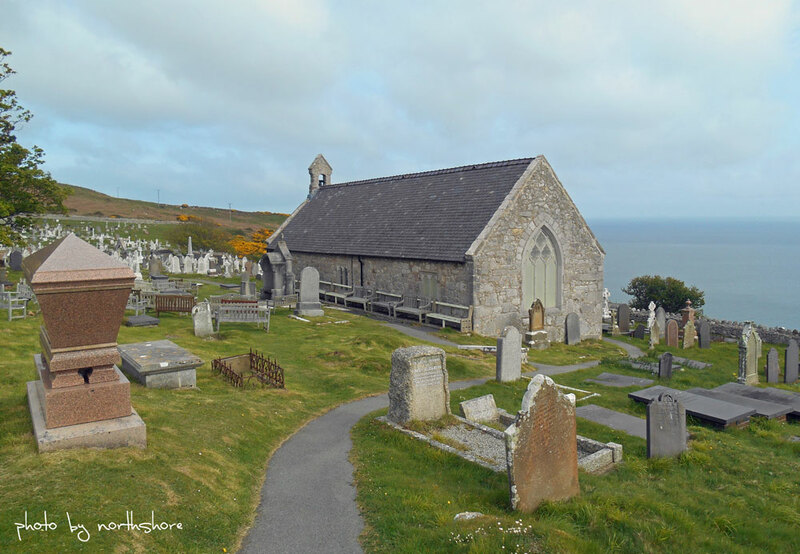 In the C6th, St Tudno built a small church on the Great Orme. Nothing remains of the original church which was replaced by a stone building in the C12th, and gave its name to the small village that grew up at the base of the Great Orme. The church was a long walk from the town and poorly attended, so when the roof was badly damaged by a storm in 1839, it was decided to build a new church, St George’s, in the centre of the village. St Tudno’s has since been restored and is now open daily in the summer, with open air services. It is open weekends during the winter. By the mid C19th, the population of Llandudno was around 1000, with men being employed in the copper mines, fishing and subsistence agriculture. In 1848, proposals were put forward to develop the town as a holiday resort, for visitors from Liverpool, Manchester, Crewe and the West Midlands. The first visitors arrive by boat, but the town grew rapidly with the arrival of the railway in 1848. Holy Trinity Church was built to serve the increasing population. North Bay with its promenade and grand hotels became the main pleasure beach. A pier opened in 1878 and for a time was used by steamers to the Isle of Man. There were grand plans for a service to Ireland, but these fell through with the development of Holyhead. The pier survives with its attractions, amusement arcades and cafes. Shops along Mostyn Street still have their splendid cast iron arcades. The Town Hall was built in 1902, replacing an earlier building. As visitor numbers increased, so did the attractions. A traditional Punch and Judy show opened here in 1860, after the horse of travelling showman Richard Codman died, leaving him stranded here. He gathered drift wood to carve the puppets which are still delighting children and adults today. The four mile Marine Drive was constructed round the base of the Great Orme between 1872-9, following what was originally a footpath. This is a toll road but the £3 toll also includes parking at the summit complex. It is an exciting drive carved out of the side of the hill. A self guided audio tour explains the archaeology, environment and attractions along the route. For those not wanting to drive, there is also a Vintage Bus service. Happy Valley Gardens were developed from a quarry site below the Great Orme, to celebrate the Golden Jubilee of Queen Victoria in 1887. A cable hauled tramway up the Great Orme opened in 1902 and still carries visitors to the Summit complex. A cable car up the Great Orme opened in 1969, taking visitors up the 679’ from Happy Valley to the Summit Complex. This is very much subject to winds and may be closed if winds make it unsafe to run. This also takes visitors to the Artificial Ski Slope and Snowboard Centre. The Great Orme is now a country park and is designated as a site of scientific interest. It is popular with visitors. There is always a cool breeze, a welcome change from the baking temperatures on the beach in the summer. There is good easy walking along the many footpaths and there are three way marked trails covering the history and nature. The Kashmiri goats seen wandering round the Great Orme are descended from goats given to Lord Mostyn by Queen Victoria. The small Visitor Centre is open Easter-October with interactive displays and films. The Summit Complex building contains a cafe, bar and gift shop. The Bronze Age copper mines have reopened as a tourist attraction. Alice Liddell (of Alice in Wonderland fame) and her family were regular visitors to Llandudno in the 1860s, stopping at the now demolished Penmorfa Hotel on West Bay. This is now celebrated by the Alice in Wonderland Town Tail and sculptures around the town. There is an open top Hop on Hop Off bus which takes visitors to Conwy as well as all the sights around the town. There is also a land train which runs a regular service from the promenade on North Bay to the much quieter West Bay. The Llandudno Museum covers the history of the area from pre-historic times, while the Home Front Experience concentrates on civilian life during World War Two. There is also the annual Victorian Extravaganza held every May Day Bank holiday.